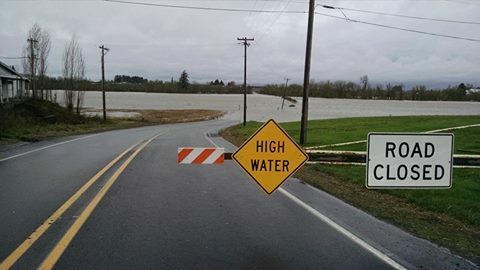 Rising river levels may lead to closure of River Road S.
Due to recent heavy rainfall, the National Weather Service (NWS) has issued a Flood Watch for the Central Willamette Valley through Friday, April 12. Localized flooding is expected throughout the week, which has already resulted in the closure of Hazelgreen Road NE between Brush Creek Road NE and Torvend Road NE due to high water. The current forecasts for the Willamette River in Salem indicate that the river level is steadily rising from heavy rainfall. When river levels rise to 23 feet, a portion of River Road South floods and Marion County Public Works closes the high water gates located east of the Independence Bridge and south of Orville Road. Public Works is monitoring the river forecasts and anticipates river levels to rise above 23 feet between 11:00 p.m. tonight and 6:00 a.m. tomorrow, and is expected to remain closed through Friday night. Motorists should prepare for possible road closures and plan trips accordingly. Road closures due to high water are enforced by Marion County Sheriff's Office, and drivers who fail to obey the signs are subject to citations. We ask drivers to please obey road closure signs and to turn around if they see high water over the road ahead. It takes just 12 inches of flowing water to carry a car and 6 inches of flowing water to knock over an adult. Information about weather-related road closures is available on the Marion County Public Works website at http://www.co.marion.or.us/PW/Roads/Pages/closures.aspx. Marion County Public Works dispatch is available 24/7 to address further questions at (503) 588-5304. For those who may be experiencing flooding, Marion County Public Works has also opened the sandbag station at Marion County Fire District Station #1. The fire station is located at 300 Cordon Road NE, and bags and the sand to fill them are free to the public, and tools are also on-hand. The sandbag station will be open and stocked throughout this week. Finally, forecasts can change, so the county encourages motorists to monitor the forecast, which is available to the public via the NWS at http://water.weather.gov/ahps2/hydrograph.php?wfo=pqr&gage=slmo3. ​In celebration of the 100th anniversary of the Historic Railroad Bridge in Mill City, amateur and professional photographers are invited to enter their best images of the bridge in the "Mill City Historic Railroad Bridge Photo Contest" hosted by Marion County Public Works and the Save Our Bridge Committee in Mill City. The contest allows photographers of all skill levels to capture photographs of the bridge through their own unique lens. Send in your best photos for a chance to win! One grand prize winner will receive a $500 cash prize and the four category winners will each receive $125 cash prizes, thanks to the generosity of the contest's sponsor Santiam Hospital of Stayton. Winning contestants will receive their awards at Mill City's Historic Railroad Bridge Centennial Celebration on Saturday, September 14, 2019, in Mill City where their winning photos will be framed and displayed. Following the celebration, the framed photographs will also be displayed at the City of Mill City and Marion County Public Works offices, and the digital images on the city's and county's websites. Contestants may submit up to two photos for each of the following categories: Natural Setting, Architectural Features, Community Life, and Seasonal. Only digital photos will be accepted and although they will remain the property of the contestant, by entering the contest photographers grant Marion County and the City of Mill City the rights to publicly display and reproduce the photo in future publications, websites, and programs. For a full list of contest rules and to enter photos in the contest, visit the Mill City Historic Railroad Bridge Photo Contest web page at www.millcitybridge.com. Entries must be submitted by 5:30 p.m., Wednesday, August 14, 2019. Contest entries will be judged on overall quality, creativity and how well the photograph portrays the Mill City Historic Railroad Bridge in the four listed categories. Mill City's Historic Railroad Bridge was built in 1888 and moved to Mill City by the Southern Pacific Railroad in 1919. The railroad suspended service to Mill City in 1967 and the last train crossed it in 1971. 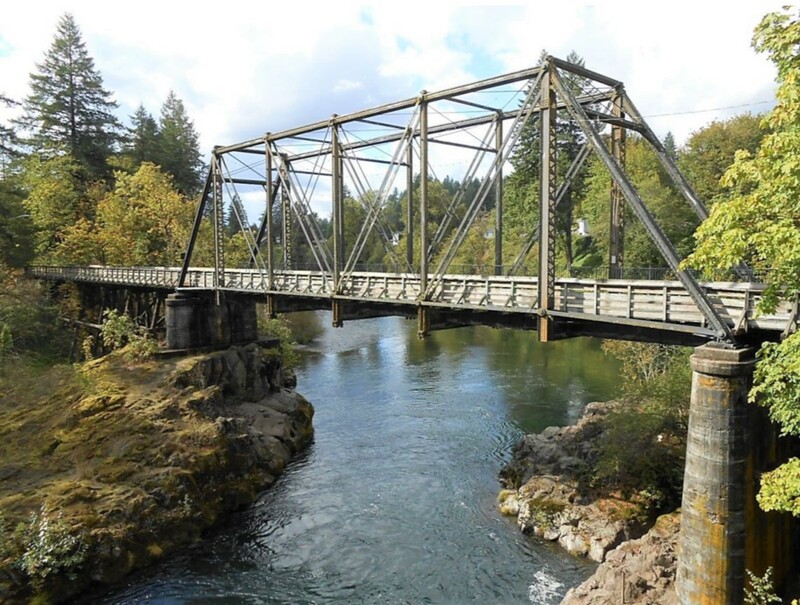 It now serves the community as a well-used bike and pedestrian bridge and is the last remaining Phoenix Column Bridge still in service in Oregon. To submit photo entries and learn more about the contest, go to www.millcitybridge.com. ​Marion County Parks announces that St. Louis Fish Ponds Park will open for the season on March 1, 2019. The popular warm water fishing and dog training destination is located thirteen miles north of Keizer off St. Louis Road. 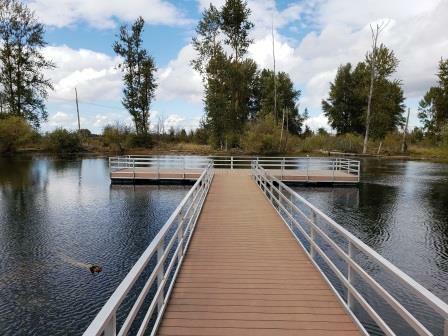 The park has a concrete pathway to the fishing sites, as well as ADA accessible docks, restrooms, and picnic tables, and is open daily from 8:00 a.m. to sunset. For more information, please call 503-588-5036 or visit the Marion County Parks web site at http://www.co.marion.or.us/PW/Parks/Pages/default.aspx. For information about fishing and gun use at the park, please contact the Oregon Department of Fish and Wildlife at 503-947-6100. ​Beginning Monday, March 10, 2019, the Marion County Dog Shelter is introducing new public hours. The shelter will be open Monday – Friday 12 p.m. to 6 p.m. and 10 a.m. to 4 p.m. on Saturdays. Additionally, dog control enforcement will be expanded to provide weekend service. "The new hours are in response to community requests for evening shelter hours," said Community Service Director Tamra Goettsch. "By staying open later we'll be more responsive for found dog intake and lost dog returns, reuniting people and their pets that much faster." The expansion of dog control hours will allow dog control officers to increase dog safety services throughout Marion County. Purchasing of dog licenses and adoption services will be available during the shelter's public hours. Dog license and other fees will increase beginning February 1. Dog license and impound fees and fines are part of the shelter's annual operating budget and are used to help cover the cost of shelter operations, including dog control officers who help maintain community safety. This will be the first increase in fees for the dog shelter since 2011 and the first increase to licensing fees since 2002. License fees for will increase from $17 to $20 annually for altered dogs and from $32 to $37 for non-altered dogs. Discounted fees are available for multi-year licenses and for senior dog owners. A full fee schedule is attached. For more information about Marion Dog Services fees and hours, visit www.mcdogs.net, call (503) 588-5233, or email dog@co.marion.or.us. Marion County Dog Services operates the county dog shelter whose mission is to provide shelter and care for stray dogs until they are reunited with their families or adopted; enforcing Marion County dog licensing and control ordinances; promoting humane treatment of dogs; and educating residents on quality dog care. 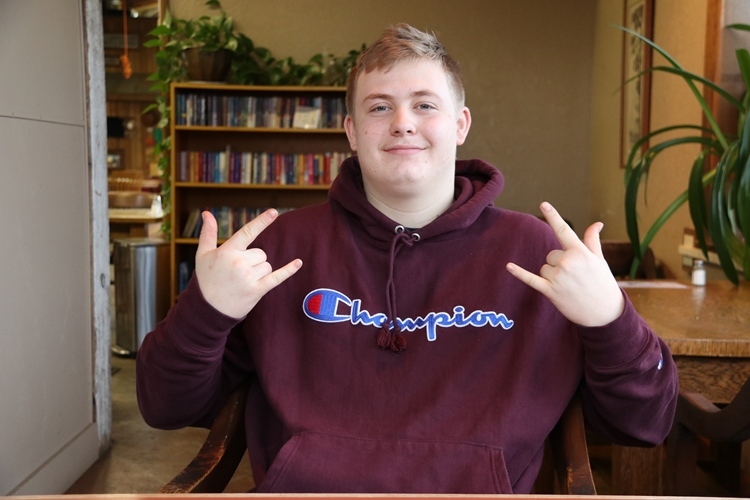 A local high school senior has turned his struggles with drugs into an award-winning song and a trip to the Grammy Awards. Andrew McMains, 17, co-wrote a rap song with David Bond that won first place in the ninth-annual Teens Make Music Contest. The song's message is "using drugs comes with a price," McMains said. "I'm just a normal kid that has been through some hard times in my life." Sponsored by the Recording Academy's charity, MusiCares, the national contest is for teen musicians whose original composition "celebrates life above the influence or brings attention to the real-life consequences of substance misuse." McMains is close to graduating from Marion County's juvenile STAR Court – Supervised Treatment and Recovery. The intensive program combines substance abuse treatment and other services with ongoing court appearances. It is for youth aged 14 to 17 who are on probation for non-violent offenses and have substance abuse problems. Once youth successfully complete the multi-level program, their juvenile court records are expunged. In a celebration of gaining a fresh start, their original court documents are fed into a paper shredder during the graduation ceremony. McMains, Bond and Caleb McDonald, who tied for third in the national contest with his song "Demons," participate in Bridgeway Recovery Services' adolescent treatment program and recorded the songs at the IKE Box in downtown Salem. Bridgeway is sending all three, along with their mothers as chaperones, to Los Angeles for the Grammy celebrations. Two years ago, Bridgeway used grants from Willamette University's Atkinson Graduate School of Management and the city of Salem to buy music and video production equipment. Sonny Saltalamachia, Bridgeway's adolescent program supervisor, said the music has spawned a way for youth to journal about the difficulties in their lives. Several teens participate in the music therapy program each week. Saltalamachia creates a rap beat on a sound track, the youth discuss and decide on a topic, and then they write lyrics to the sound track. "It becomes a cathartic experience," he said. "Sometimes behind a kid's attitude lies a kind and vulnerable kid who has had a lot of trauma in their lives. Once you get to know them, they're beautiful on the inside." McMains and Bond's song, titled "Lost," is about that vulnerability. The verses recount what they encountered by using drugs, with a chorus told from the mother's perspective. Joe Kauffman, McMains' probation officer, said there are a lot of misconceptions about juveniles who get into trouble with the law. "Most of these kids have a lot of trauma in their lives and then they start acting out," he said. McMains hopes to continue making music, as well as pursuing his interest in photography that he developed through high school classes. "I'm just so proud of Drew," said his mother, Cassie Ricketts. "He's so talented." She said she doesn't know where their family would be without Saltalamachia, Kauffman and STAR Court. "They truly, really care about these kids." 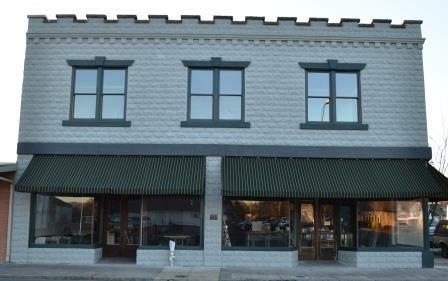 ​The city of Stayton is hoping to bring more people and businesses to its historic downtown. The area has started to fill with new shops and restaurants and a coalition of business and property owners, local leaders, and city officials has organized to plan events and promotions, as well as help implement design changes. The group is closer to its goal thanks to a Community Projects grant from Marion County. Today, Revitalize Downtown Stayton was awarded $8,500 in economic development funding for design planning and development in preparation for grant applications to complete façade improvements. The project will focus on Third Avenue restoring an historic sense to the area. Steve Poisson of Revitalize Downtown Stayton said, "The architectural services we are able to purchase with this grant money is an immensely important first step in the façade improvement work we have set as a priority goal. Not only will it be used for applications to other grants to complete the work, it will also serve as a template for all future work in our focus area." This project is similar to façade improvement grants awarded to Mt. Angel and Mill City. Additionally, the city of Donald was able to expand its urban growth boundary to support housing and industrial property needs with the assistance of a planning grant. 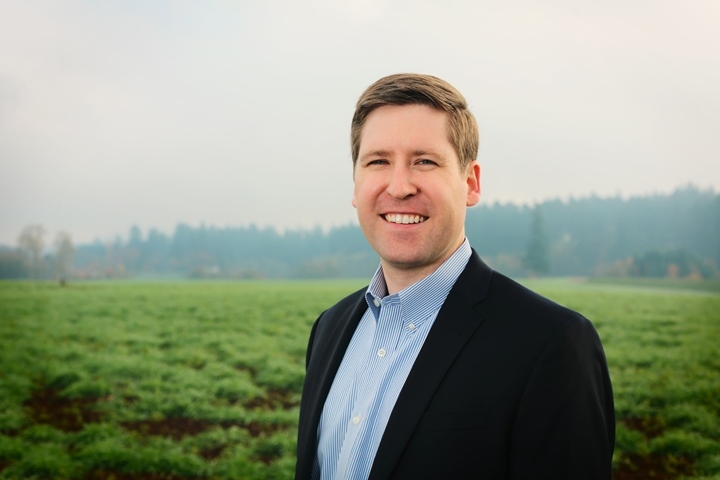 Commissioner Kevin Cameron, board chair, said, "These are excellent examples of how the county is supporting rural communities to make them great places to live, work, and play. We are fortunate to have great partners in all 20 of Marion County's cities." In the current year, Marion County has allocated $60,000 to support community projects grants. Grants provide funding to nonprofits and municipalities for projects that promote economic development by increasing the livability and safety within communities and unincorporated areas of the county. Community projects grants are accepted on an ongoing basis. For more information, contact Economic Development Coordinator Tom Hogue at (503) 589-3277 or thogue@co.marion.or.us. Funding for economic development grants is made available through state video lottery proceeds. Annually, the Board of Commissioners directly designates a portion of lottery funding to support infrastructure and organizations that focus on economic development. In the last five years, Marion County has awarded more than $350,000 to 39 community projects throughout the county. ​The Board of Commissioners recently approved the Comprehensive Annual Financial Report (CAFR) for the fiscal year ended June 30, 2018. Grove, Mueller & Swank, P.C. provided an unmodified opinion which is the highest level of assurance for audited financial statements. The audit was completed in accordance with government auditing standards and Oregon standards for local governments. The CAFR provides an overview of the county's financial position. Marion County Chief Administrative Officer John Lattimer said, "Marion County remains in good shape thanks to our knowledgeable and professional finance staff. They keep us on target and ensure our accounting procedures meet financial standards." Commissioner Kevin Cameron, board chair, said, "This report illustrates the county's positive financial position. We have been judicious in how and when we borrow and we remain far below our debt limit which helps us keep a favorable bond rating." Marion County received the Certificate of Achievement for Financial Reporting from the Government Finance Officers Association for the annual financial report for the year ended June 30, 2017. This is the 17th consecutive year the county has received this award. The county has submitted the 2018 report for evaluation by GFOA. Residents can review the 2018 CAFR, as well as prior reports, on the Marion County website. ​Marion County has closed all parking fee stations along the North Fork Road Corridor for the season. Visitors to that area will not be required to pay parking fees until the fee stations are reopened on May 15, 2019. For further information, please contact Russ Dilley, parks coordinator, at 503-588-5036 or parks@co.marion.or.us.